eTail, a marketing partner of the Web Marketing Association, is your one-stop shop for all things multi-channel and eCommerce; an event where inspiration meets innovation; socializing meets ROI. We’re bigger and better this year – covering every topic related to your job, both strategically and tactically. Experience tons of new sessions, interactive learning, guest speakers and keynotes, all in beautiful Palm Springs. Keynote speakers come from top retailers – companies such as Barnes & Noble, JustFab, HSN, Coach, HP, Sears – to name a few. You can attend high impact presentations, debate –themed panel discussions, collaborative working group sessions, retailer only meet-ups – you’re guaranteed to leave with pages of notes. Bring your team – there’s more sessions and content than ever before. Where else can you network like you can at eTail. Nowhere. There is a new chance to make a valuable business contact, connect one on one with other retailers and catch up with old friends – every single day. 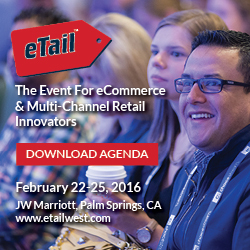 Register today using code ETW16WMA to receive 25% off the full conference price for qualified retailers!